A visit to your local graveyard can provide not only a history lesson, but a science lesson as well. Historians know that gravestones can reflect the lives of people whose memories are lost in time, and they have long scoured old burial sites to piece together the stories of those who rest there. But today scientists are learning much more from those letters carved in stone. Gravestones are telling the story of changes in Earth’s atmospheric chemistry and rainfall. Moreover, scientists are asking for your help to read the stones. The iconic white marble headstones found in most graveyards around the world are wonderful diaries of changes in the atmosphere. Chemical interactions occur between the marble and the atmosphere over time. Little by little, atmospheric gases dissolved in rain drops cause the marble to erode. Changes in atmospheric chemistry also change the rate at which the marble weathers. By accumulating volunteers' measurements of marble gravestones of different ages around the world, scientists hope to produce a world map of the weathering rates of those gravestones and thereby deduce how the atmosphere has been changing. Participants are asked to take measurements using simple calipers and GPS, following a set of scientific protocols that are explained online. Data is then logged by participants directly into the scientific database via the project Web site. The project is part of the new global citizen science program called EarthTrek, which is administered by The Geological Society of America in partnership with organizations across America and around the globe. People interested in participating can register online and follow links to the Gravestone Project or any of several other scientific research projects currently underway through the EarthTrek program. "Being involved in EarthTrek provides people with the opportunity to be involved in real scientific research," says Gary Lewis, EarthTrek Director. "The data they collect while participating in a wonderful outdoor activity may make a real difference in the way we manage our environment. And it's free to participate!" Not only can participants be involved first-hand in scientific research, they can also accumulate points for online rewards and other recognition. 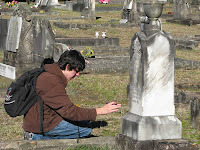 EarthTrek can become an obsession --enthusiasts sometimes plan weekend trips to collect gravestone data or engage in other EarthTrek activities. Other current studies involve spotting hummingbirds and investigating invasive plant species. More projects are soon to be added. "We are working with scientists on new projects involving hail, natural springs, animal and plant inventories, and much more," Lewis says.